The Wilma Theater concludes its 2009 – 2010 Season with the U.S. Premiere of Leaving, by Václav Havel. The first play in 20 years from playwright and former Czech President Havel, Leaving will receive its U.S. Premiere production under co-Artistic Director Jiri Zizka’s direction, with Academy Award® nominee David Strathairn (Good Night, and Good Luck) starring in the role of ex-Chancellor Dr. Vilėm Rieger. Leaving is an inventive story of a recently-retired Chancellor who confronts large questions of truth and power while he struggles to manage his eccentric family and humorous bevy of functionaries. Allusions from Chekhov’s The Cherry Orchard and Shakespeare’s King Lear invade the Chancellor’s consciousness in this wry political tragicomedy. An epic production with a cast of 15, Leaving is directed by Jiri Zizka, who previously directed the feature film of Havel’s Largo Desolato, adapted by Tom Stoppard, starring Academy Award® winner F. Murray Abraham. Zizka also directed the U.S. premiere of Havel’s Temptation off-Broadway at Joseph Papp’s Public Theater in New York, with Strathairn in the lead role. Leavingbegins previews on May 19, opens on May 26 (press night), and closes on June 20, 2010. President Havel and his wife Dagmar are planning to attend the Opening Night performance of Leaving on May 26, 2010. Tickets range from $36 to $65, and are available at the Wilma’s Box Office by calling (215) 546-7824, visiting www.wilmatheater.org, or coming to the theater, located at 265 South Broad Street in Philadelphia. Student tickets are available for as little as $10, depending on date and time, made possible through a grant from PNC Arts Alive. Veronika Jonkers left her cherished grandfather’s farm in South Africa to pursue her dream of becoming a cabaret singer in Cape Town. Years later, she returns to her hometown with broken dreams, a painful secret, and the unflinching hope of building a new life for her young son. The latest play from master playwright Athol Fugard – hailed by Time magazine as “the greatest active playwright in the English-speaking world” – Coming Home is a soaring emotional experience. The World Premiere of Language Rooms is a subversive dark comedy about two Arab-American interrogators at an undisclosed American facility somewhere in the world. They strive to prove themselves the best at their jobs in the midst of absurd office politics and management constantly questioning their loyalties and dedication to “the company.” From an exciting new playwright, Yussef El Guindi, this play will spark debate about family relationships, identity, the War on Terror, and the corruption of the American Dream. Shifting between comedy and political suspense, the play conjures up a surprising twist not to be given away. Subscription prices range from $32-$210, with Flex Subscriptions available that give subscribers the flexibility to choose performance dates over the season. Special discounts are available on single tickets for seniors, students, educators, and groups of 10 or more. Subscriptions and tickets are available by calling (215) 546-7824, visiting The Wilma Theater box office located at 265 South Broad Street in Philadelphia, or online at www.wilmatheater.org. The Wilma Theater exists to present theater as an art form, engaging artists and audiences in an adventure of aesthetic philosophical reflection of the complexities of contemporary life. The Wilma produces thoughtful, well-crafted, productions of intelligent, daring plays that represent a range of voices, viewpoints, and production styles. During the tenure of co-Artistic Directors Jiri and Blanka Zizka, The Wilma Theater has established a national reputation for provocative work ranging from the international drama of Bertolt Brecht, Athol Fugard, Eugene Ionesco, Joe Orton and Tom Stoppard to new American plays by Tina Howe, Romulus Linney, Quincy Long, Doug Wright, Amy Freed and many others, as well as premiering Jiri Zizka’s original adaptations of classic novels. Inspired by the U.S. 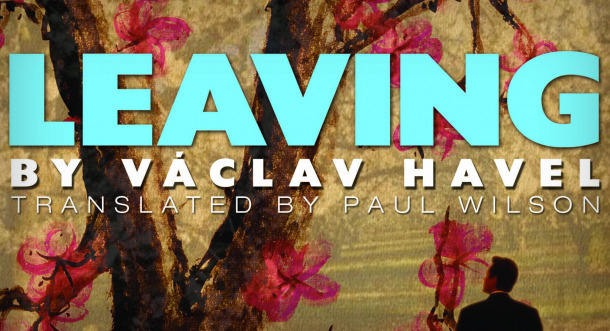 Premiere of Leaving, by Václav Havel, The Wilma Theater will conduct two symposium sessions exploring Havel’s legacy and the historical and dramatic background of Leaving, his first new play in over 20 years. Václav Havel: The Art of the Impossible will occur on Sunday, May 30 at 4:30 pm, and Politics and Hubbubs will follow on Sunday, June 13 at 4:30 pm. Václav Havel, former Czech president, playwright, and most revered of Eastern European dissidents during the Cold War, came to Philadelphia last week for the U.S. premiere of his new play, Leaving, at the Wilma Theater. So I sat down with Havel to seek his evaluation of democracy’s status two decades after communism’s fall. “I think that if you are a good writer, a good playwright — which I’m not claiming to be; that is for others to judge — then you are not forgotten as quickly as politicians,” Havel says. “Politicians come and go; literature remains.” The 73-year-old playwright is visiting Philadelphia for the U.S. premiere of Leaving on May 26. In between that and his other obligations, Havel is making time to direct a film version of the play. “Leaving” is about a Chancellor leaving office, with echoes of “King Lear” and “The Cherry Orchard.” Speakeasy spoke with director (and Wilma co-Artistic Director) Jiri Zizka. Zizka left Czechoslovakia in 1976.